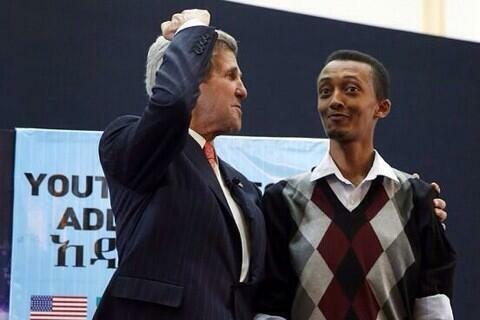 As Ethiopia Jails Another Journalist, US Is Asked, Will Kerry Raise in Addis? UNITED NATIONS, April 27 -- After Ethiopia conducted a sweep and arrest of journalists including Tesfalem Woldeyes and six bloggers from the Zone 9 collective, that the US had highlighted bloggers in Russia and Vietnam on April 25 was raised. And this question: with US Secretary of State John Kerry slated to visit Addis Ababa next week, when will the US raise the issue? Inner City Press was sent a photo of one of the now-arrested bloggers Natnail Feleke posing with Kerry last year, here. He was asked, later on April 26, "Will John Kerry be raising it in Addis?" Now Ethiopia has arrested yet another journalist, Asmamaw Hailegiorgis, editor of the weekly magazine Addis Guday. In the run-up to Kerry's Africa trip, there are been conflicting messages whether he will or will not be going to South Sudan. Should the messaging be clearer on this straight-forward "Free the Press" issue?